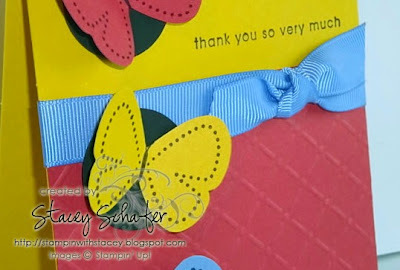 Earlier this week I heard news that two of my stamping friends are both expecting a baby in May 2010! 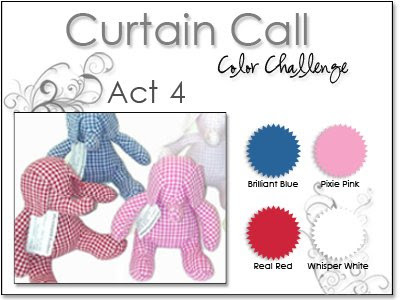 It's always exciting to hear news that a little bundle is on it's way:) These sweet little Gingham Elephants are from Rosenberry Rooms, an online store loaded with darling baby and child gifts! 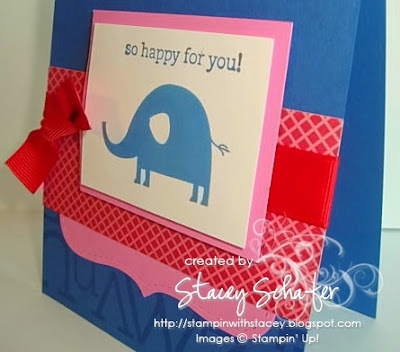 To play along in the Curtain Call Color Challenge Act 4, simply create a papercrafted project using these Stampin' Up! colors (or similar shades from other companies), post it on your blog or other public gallery (Splitcoaststampers, Paper Craft Planet, etc.) using the keywords Curtain Call, link your posting back here, and then come back to enter your name and URL in the Mr. Linky box. You have until Sunday, September 20th at noon (CST) to enter your project. 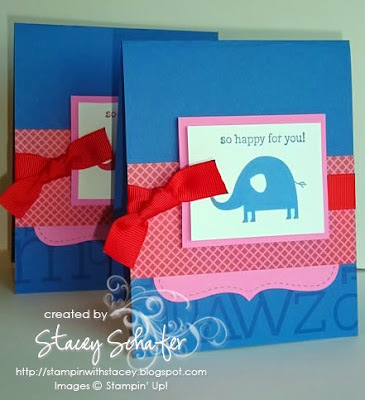 I ran the Alphabet wheel along the bottom of my Brilliant Blue card base with Brilliant Blue ink, then adhered half of a Pixie Pink Top Note die cut followed with a strip of Jackpot Designer Series Paper. The Real Red Grosgrain was wrapped around the entire card front and tied together with a square knot. 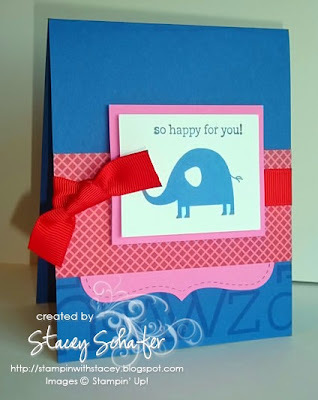 After stamping the sweet elephant image (and sentiment) from the Nursery Necessities stamp set using Brilliant Blue ink on Whisper White cardstock, I mounted it on another piece of Pixie Pink cardstock and attached it as the focal point with Stampin' Dimensionals. 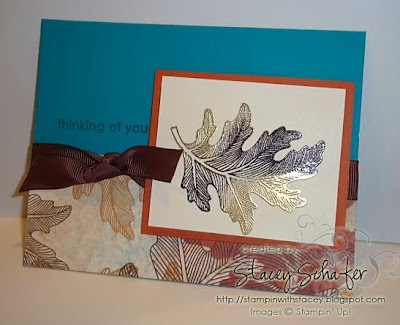 I was inspired by two talented gals today...the Splitcoaststampers Featured Stamper #136, Shannon, and the Inkspiration Inspiration Challenge hostess, Makeesha. 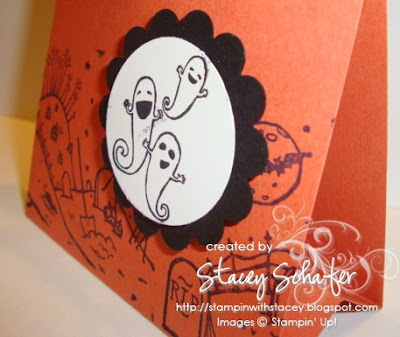 My layout is one that I copied from Shannon's amazing gallery...you can see her card HERE. The beautiful color combination came from a display of bedding that Makeesa posted on her blog for the Inkspiration Inspiration Challenge #12. 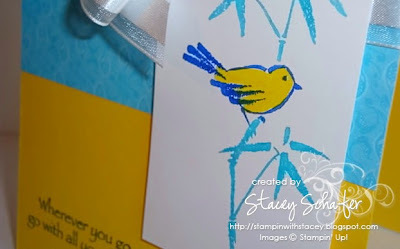 I inked up and filled in this image from the Asian Artistry hostess stamp set with my Brilliant Blue, Tempting Turquoise & Yoyo Yellow Stampin' Write Markers. 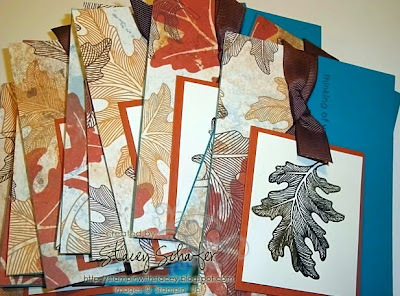 The image panel was adhered with Stampin' Dimensionals over a strip of Pink Flamingo Designer Series Paper wrapped with a shimmery piece of Whisper White Organza ribbon. 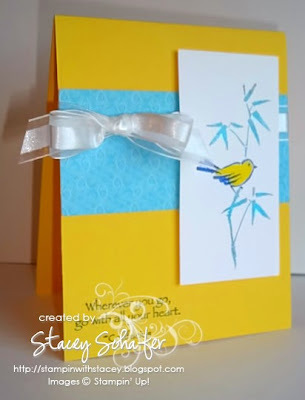 The card base is Yoyo Yellow with a Brilliant Blue sentiment placed in the bottom left corner. 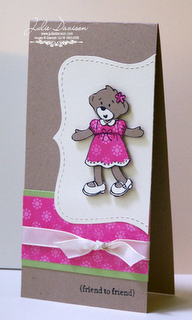 My favorite submission this week was Julie's Friend to Friend BABW card...totally made me smile with that darling little beary girl:) Congratulations, Julie, on being our Showstopper for Act 3! I'm back! Thank you to all of you who asked about me over the last few weeks! I'm finally getting back into the stamping swing of things! Boy, have I missed my stamping therapy sessions! My stamp room is coming together and I was actually able to make some projects at the end of last week....YEAH! I'll be posting some of them for you to see very soon, and I'll be sharing some photos of my "Stamping Stage Studio"...so stay tuned! 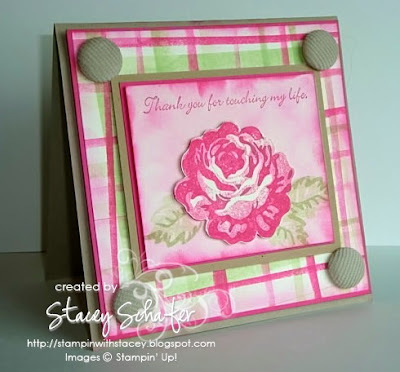 Here is a photo of the rose that I received on stage at Stampin' Up! Convention for my Rising Star award. This rose had quite a trip home, back to Illinois, where my dear daughter, Hannah, claimed it as her own. The colors in the photo are Certainly Celery, Kraft, Melon Mambo, and Very Vanilla. 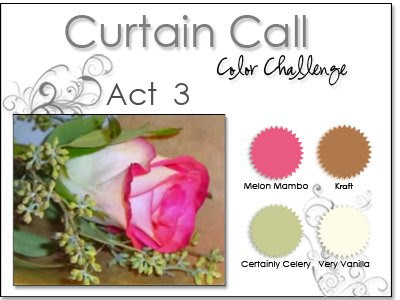 To play along in the Curtain Call Color Challenge Act 2, simply create a papercrafted project using these Stampin' Up! colors (or similar shades from other companies), post it on your blog or other public gallery (Splitcoaststampers, Paper Craft Planet, etc.) using the keywords Curtain Call, link your posting back here, and then come back to enter your name and URL in the Mr. Linky box. You have until Sunday, September 13th at noon (CST) to enter your project. I used a new technique on this rosey card called Striped Brayering. I just watched the Workshop Wow DVD last night that I bought when I was at convention a few weeks ago. The Striped Brayering technique is one of the "wow" techniques featured on the DVD. It's super easy! All you do is run just the edge of your brayer along the ink pad(s) and apply to the cardstock in a striped fashion. Start with your light color first and then add more contrasting ones as desired. 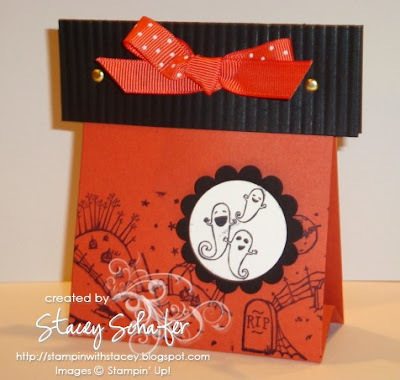 My friend, Katie from KB Stamps, invited me to participate in a Holiday Mini Swap. Thanks, Katie! 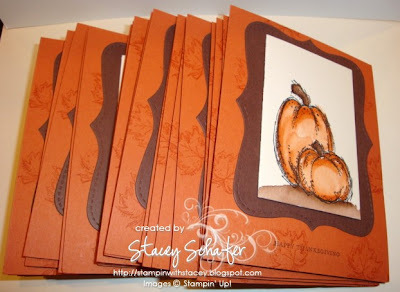 Head on over to see Katie...she's got some BLOG CANDY up for grabs:) My swap card encorporates two new products from the Holiday Mini, the Autumn Splendor stamp set and the Autumn Meadows Designer Series Paper. I also used a new technique that I recently learned called Rainbow Embossing from the Workshop Wow DVD that I got at Convention. 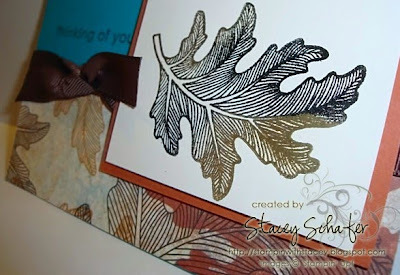 Basically, you just use more than one color of embossing powder...I used Black and Gold Embossing Powder. I'm heading to Cincinnati for the Regional Seminar tonight with my downline, Libby. These are the swaps that I'll be trading while I'm at this fun Stampin' Up! event! 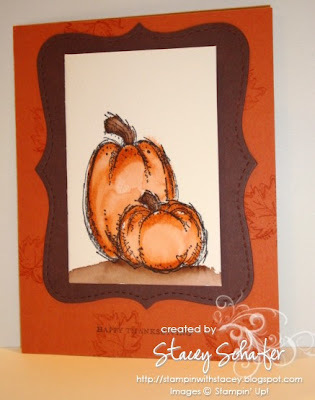 I watercolored the images from the Autumn Harvest stamp set and mounted them on Chocolate Chip Top Note dies with a Really Rust card base that includes a little background stamping with Really Rust ink. The sentiment is from the Teeny Tiny Wishes stamp set. 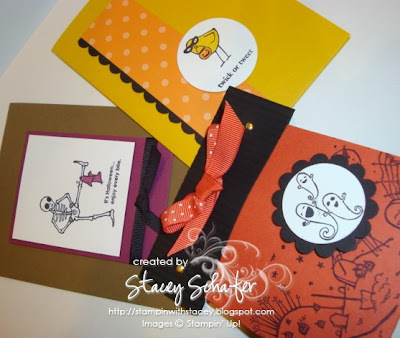 All three of these projects were case'd from my upline, Julie at Julie's Stamping Spot. 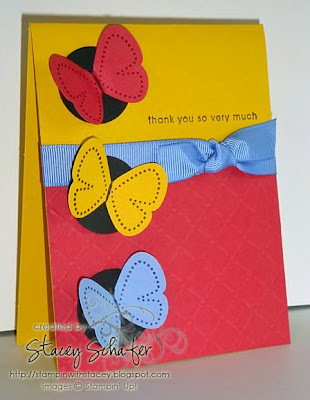 Thanks, Julie, for the great ideas during this hectic time:) All three of the projects for this month's stamp club featured the new Twick or Tweet stamp set from the Holiday Mini catalog. I also used the coordinating wheel called Haunting Hill for the goody treat bag. Finally Got to Play at the PPA! I have been wanting to play in the Pals Paper Arts challenges for several weeks! What a fun challenge site! 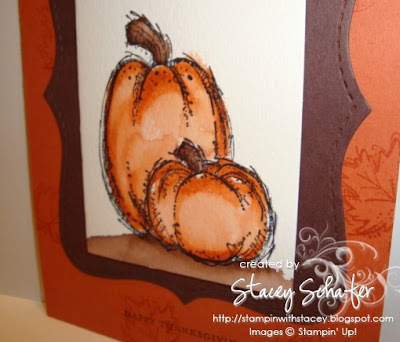 The challenge this week is to use the Stampin' Up! colors Brocade Blue, Crushed Curry & Ruby Red...beautiful combo! 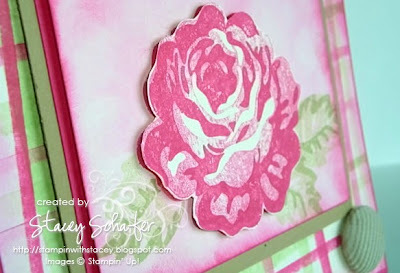 I was additionally inspired by the Featured Stamper Challenge #135 over at Splitcoaststampers today.